WG Security Products, Inc., San Jose, Calif., is pleased to announce a key addition to their U.S. senior management team. 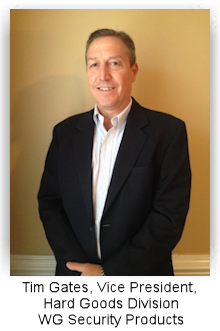 Tim Gates has joined WG Security Products as Vice President, Hard Goods Division. With over 20 years of successful electronic article surveillance experience, Tim will be responsible for developing this critical vertical market in North America's retail industry. With WG Security Products' deep worldwide history of designing, manufacturing, and delivering some of the industry's most well known hard goods EAS solutions, Tim's main objective will be to develop responsive partnerships with the retailers throughout North America and expand and integrate WG's well established, new, and future EAS hard goods solutions. Tim joins WG with an extensive and very successful background in the hard goods EAS industry specifically. His subject matter expertise will help ensure that WG develops and delivers Best-In-Class solutions, with leading edge technology, that are focused on increasing sales and maximizing each retailers return on investment. "Our worldwide market and manufacturing capabilities have been well established for some time," noted Graham Handyside, Executive Vice President Worldwide Operations for WG. "We see a great opportunity with Tim joining our team, to partner with the U.S. retailers and provide them with a hard goods subject matter expert that is dedicated to improving their sales with the most technologically advanced and cost-effective EAS and RFID solutions available in the market. We're pleased to have Tim join our team and offer this resource to the U.S. retailers." Tim is committed to adding value to each retailer he engages and believes that EAS solutions must go well beyond merely preventing theft and actually allow a retailer to improve sales and profitability. "With the customer experience being the driving force in today's highly competitive retail environment EAS solutions have to add value to that experience while at the same time maximizing sales and offering maximum protection. A balance that can prove to be very challenging. With over 20 years of experience in this industry myself and coupled with WG's worldwide design expertise, I firmly believe we're well positioned to make major contributions in the U.S. retail market." About WG Security Products, Inc.
WG Security Products designs, manufacturers, sells, services and supports the world's most advanced lines of fully integrated electronic article surveillance (EAS) and Smart Tags RFID. The company's customers represent all market segments including retail, gaming, and private industries. Our international staff of engineers works hard every day to provide tomorrow's answers to today's questions. Featuring outside-the-box thinking that our competitors cannot match, WG is bringing loss prevention solutions into the 21st century and beyond. WG was formed in Asia more than a decade ago. We have maintained our international presence with corporate and warehousing locations in California, Shanghai and Germany. Our products can be seen all over the world, from Eastern Europe and Asia and the Middle East to Africa, Australia and the Americas. Our expansive business partner network abroad and regional specialists in the United States ensure that WG is never too far away from you. WG Security Products' name equals safety and protection. We deliver the high-tech products to provide safety and protection for people, assets, and information. WG is one of the world leaders in electronic security, and many of our customers are among the top retailers worldwide. Department and specialty stores, discount and general merchandise stores, drug stores, supermarkets, hypermarkets, music and video rental stores, home centers. Commercial offices, factories, government facilities, hospitals, colleges and universities, casinos. Plus, a strong dealer/distributor network worldwide that helps us meet their customer's security needs. Tim Gates directly at tgates@wgspi.com for more information on how he can add value to your EAS efforts.